We believe that Lumify fits in the Optimizing category as it is a mobile ultrasound solution made for clinicians who seek simple yes no answers during patient screening, i.e., in the Emergency Room- “is there internal bleeding , yes or no?”. It makes ultrasound available almost anywhere and enables physicians to get a faster diagnosis, make quicker decisions, and deliver care wherever it is needed. The Lumify App transforms any compatible smart device into a high quality ultrasound system. 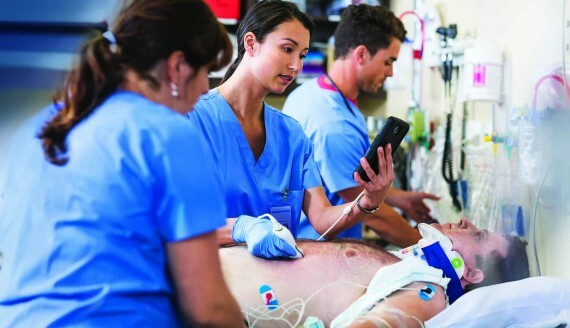 It enables speedy assessments, allows to connect to patient information, and share images, video, and notes with colleagues. The design takes its cues from the simplicity of today’s photo apps to make users feel familiar with Lumify and get quick diagnostic answers right from the start. Lumify provides an entire ecosystem of ultrasound Apps and transducers, web portal, e-store, and workflow accessories. It’s a total experience designed to provide clinicians with clinical insights, ongoing support, and the tools they need for diagnosis and collaboration. Lumify offers a subscription based service to reduce the upfront investment and to make high quality ultrasound available for more physicians and hospitals than ever before. Just download the Lumify App, plug in the transducer, and start scanning!